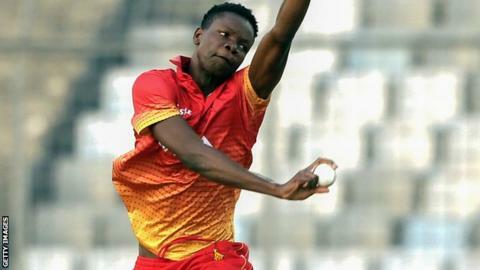 Northamptonshire have signed former Zimbabwe seamer Blessing Muzarabani on a three-year Kolpak deal from the start of the 2019 County Championship season. Muzarabani has been capped 24 times in limited-overs games but put his international career on hold in August. The 6ft 6in 21-year-old took 4-40 for Northants' second XI in a one-day fixture against Durham in May. "We were impressed by the way he played for the second team against Durham," head coach David Ripley said. "He's got a lot to learn and he knows it, but we're looking forward to helping him achieve his potential at the County Ground." Kolpak contracts allow sportsmen from countries with associate trade agreements with the European Union to be afforded the same right to free movement as EU citizens. They are not classed as overseas players under the terms of their contracts, but they become ineligible to represent their country at international level.